The self-employment bug has hit our household. Hard. I knew without a doubt that Ben would love to review a set of books from Micro Business for Teens. Since giving up his paper route a year ago, he has been trying to get his own business off the ground. This set of books from Micro Business for Teens has really inspired Ben to make some deliberate steps forward in his plan for independent wealth (*grin*). The books themselves provide practical, step by step suggestions and guidance as your teen (the books are ideal for ages 10-18 according to the publisher) goes through the process of developing a micro business. The workbook provides a written place where students can document their brainstorming, research results and plans. The program was written by CPA Carol Topp. She has advised plenty of successful teen business owners. 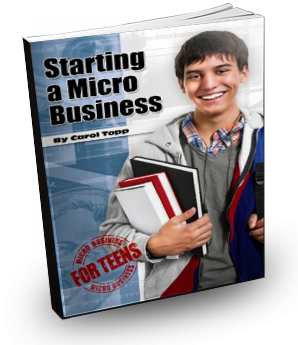 The Micro Business for Teens Workbook allots a chapter of work for the chapters from each books. Workbook pages have fill-in-the-blank and short answer responses to help students review important information from the texts. They also provide templates for students to use to brainstorm ideas and develop skills (such as some basic accounting) necessary for business success. How We Used This: This was one of those products that I handed to Ben and watched him progress through it. My expectation was to do a chapter of reading and the corresponding workbook pages at least on a weekly basis. This fit easily into our rather heavy workload of as spring classes came to an end and final projects (the play!) were completed. The chapters aren’t overly long and are written to students who have no experience in business at all. As a matter of fact, the chapter on “Legal Names and Numbers” is something that I need to read on my own so that I have a better understanding of our own small business! Some of the workbook, as I mentioned, will require students to brainstorm and/or do some research and reading online, so having an internet connection will be important for this course. You can get a sample syllabus here if you want to teach this in a co-op setting or if you’d like a systematic way to walk through this program with your teen. With the addition of a free teacher’s guide (you’ll need to subscribe to the email list, and it will be sent to you), which has discussion questions as well as some additional assignments (such as reading articles about business, partnerships, teen entrepreneurs, etc. ), I think this course could merit a 1/2 credit elective of high school business. By using this product, Ben has definitely worked through the process of thinking about what business he wants to start (he’s had ideas about several), and has gone through some beginning steps to begin to raise capital (he set up a PayPal account as well as an EBay account) to begin his business. The little bugger skipped over the section about writing a business plan, but he’ll go back and work on it! By the way, I LOVE that she includes a complete business description, marketing plan and detailed financial plan. He is definitely excited to start, but I’ll admit: I am wanting him to go through this with “eyes wide open” – which for my husband and I means that Ben works through the books and workbooks completely. My recommendations & thoughts: I really love this course and Ben really enjoys it as well. It is stretching him to think a bit more out-of-the-box than he is used to (he can be a bit linear, like his mom) to brainstorm and investigate skills and interests and how he might use them to generate income. I have found the books to be easy to read and the workbook content to be straightforward and goal- directed; there isn’t any busy work of fluff in the assignments. I’m looking forward to Ben completing the entire course and experimenting with his business ideas. Who knows where it will take him. Thank you for the review. I appreciate it. 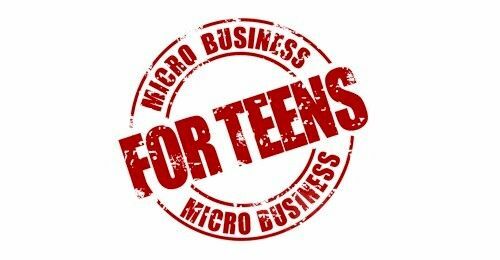 You're correct that Micro Business for Teens works well in a group or homeschool cop-op. And 1/2 credit would be about correct.